Little did Rachel know, but I had a little trick up my sleeve for our trip home for the holidays. 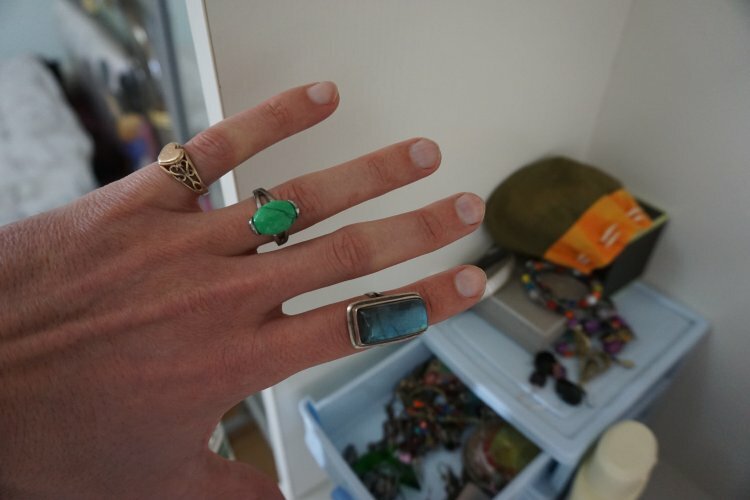 On days when she was out teaching and I was working at home, I rifled through her jewelry box and tried on her various rings in a sad attempt at figuring out her ring size. I was trying to buy an engagement ring… as a surprise… from China – it turned out to be easier said than done. I had grand plans, but so far they weren’t falling into place. One night, I came home late after an evening of gallivanting about Grosse Pointe with my brother Paul and his cronies and sat down to browse rings once again. I may have been beautifully buzzed, but there was one ring in particular that just jumped off the screen. I had been searching for amethyst rings since it’s Rachel’s birthstone, but I was unsure of whether to get purple or green. All of a sudden, this stunning five-stone ring showed up – pear-shaped peridot, pink tourmaline, blue topaz, citrine and amethyst. Her stone was right in the middle, and it was clear that I had found a winner. Size was still an issue, so I got online the next day with their “experts” to discuss it. Through my poor man’s calculations, I figured she was around a size 6. As this ring was only available in full sizes, I was advised to go with a 7 rather than risk getting a ring that was too small. Of course, when I tried it on it fell right off my finger. I knew it was going to be way too big for her, but with Christmas coming quickly I was told there was no way I could get another ring before I left for Miamii. 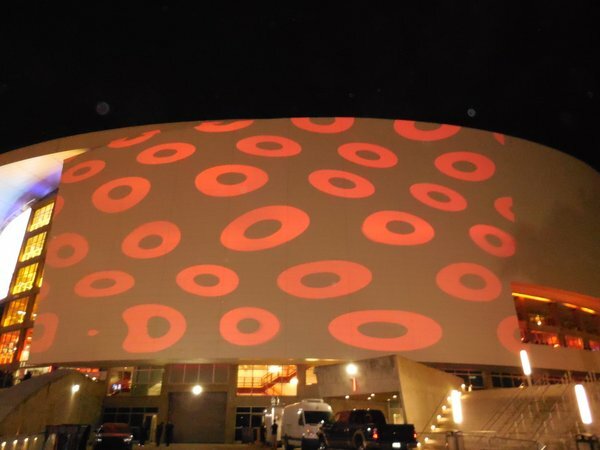 With limited options, I ordered a smaller size and had it delivered to the awful Miami airport motel that Paul would be staying in for the Phish shows. Hello, Miami! The view from our host’s 43rd floor condo. 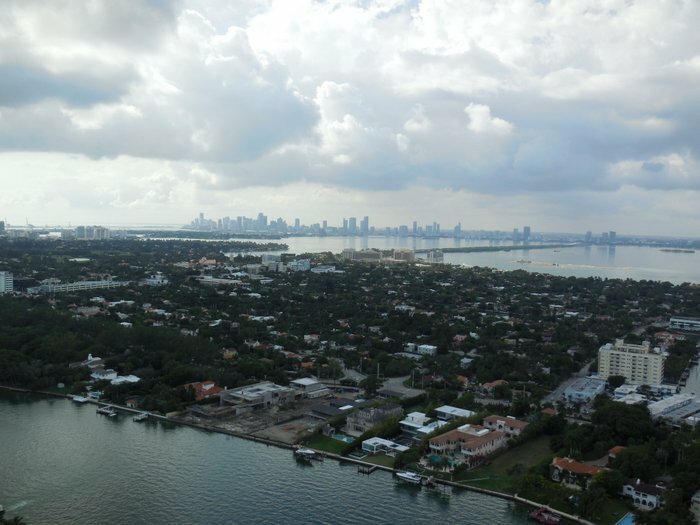 That afternoon, our crew was scattered all over Miami. The two of us headed to our digs for the week – the poolside cabana room in the condo complex of a Russian lady my dad sort of knows (long story). Our friends Pete and Katie were at the place they booked on Air BNB down in South Beach, and Paul and my cousin were out in a one-star airport motel. Somehow, some way, we were all going to meet up and ring in the New Year together. After a long night at Umphrey’s in Atlanta and a super early flight, Rachel was feeling worn out. At the same time, the clouds opened up and started pouring on Miami Beach. These weren’t exactly encouraging signs for a guy with a proposal on his mind. 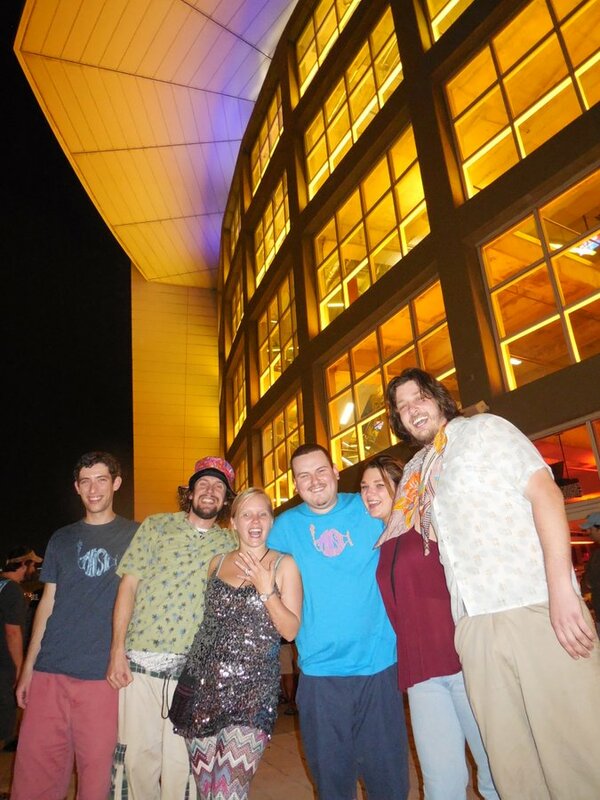 Either way, we all began our separate journeys to the AA Arena in downtown Miami to see the Phish from Vermont. Thankfully, everyone made it into the show on time (just barely for us), and Frodo safely smuggled the precious in as well. Unfortunately, our groups were split between sections in a crowded arena on New Year’s. It was going to be tricky, but we were going to pull it off. The arena is ready for the Phish! At the first set break, Paul Frodo and I met up to make the exchange of the ring. It wasn’t clear that we were all going to be able to sit together, so I wasn’t sure if I wanted to go through with it that night or wait until the next day when we could all gather in a more normal setting. At this point in the night, things were still unsure. Towards the end of the second set, Paul and the guys somehow finagled their way into our section in time for the big countdown. With the year coming to an end and the band about to hit the stage again, everyone was riding high and incredibly excited about our particular place in time. Just before midnight, we managed to snap this blurry photo that pretty accurately sums up the night. Rachel had no idea what was coming. 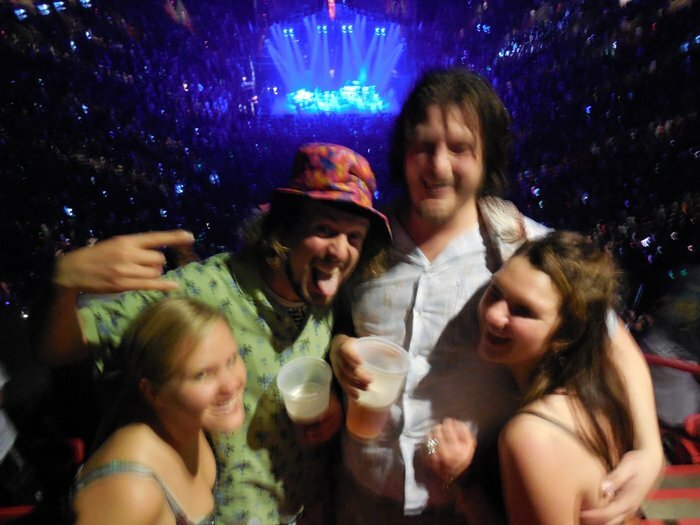 In typical Phish fashion, the New Year’s countdown was full of complete nonsense and hilarity with a balloon version of their drummer floating above the crowd after supposedly being blown up from his vacuum cleaner. 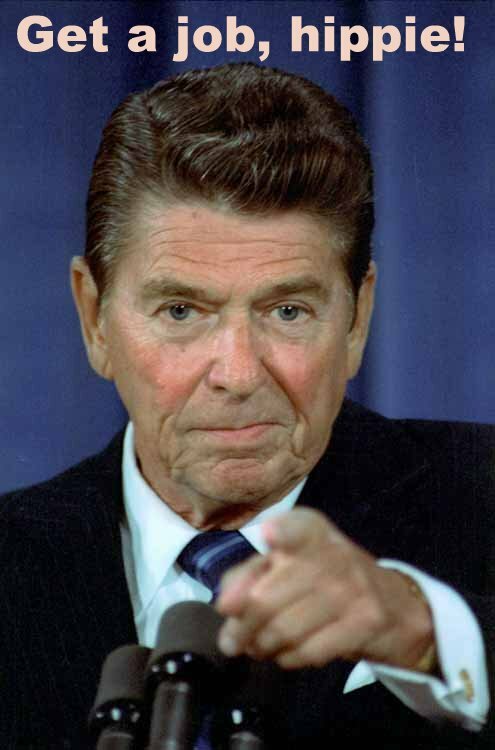 When the clock struck midnight, I swear time slowed to a crawl. The group in front of us were spraying mini-champagne bottles, confetti was raining on the crowd, and we were all sharing warm embraces to welcome the New Year. Everything was moving frame by frame – it was a sensation I had never experienced before. Sure, a little recreational chemistry may have helped, but I think it was mostly my subconscious trying as hard as it could to hold on to a moment I knew would be one of the most important in my life. Through this all, I somehow managed to hold it together enough to snap some decent video of the whole ordeal. With her precious pale ale finally in the hands of someone else, I was free to make my move. My mind was running a mile a minute, my heart was racing, and I fumbled in my pocket to pull out the ring that Frodo had so kindly brought me from Mt. Miami Springs Inn. 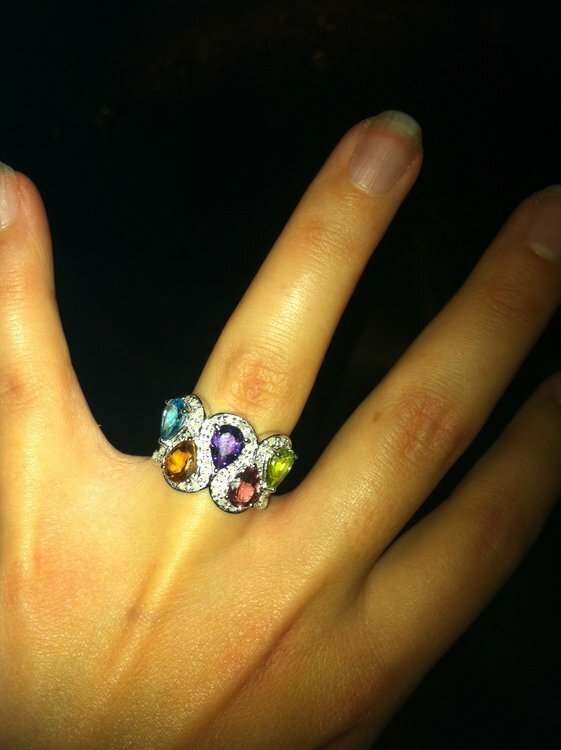 Super heady ring for a super heady girl! Since a rock and roll show was still going on in front of us, these were the only words I was able to get out that were actually audible. 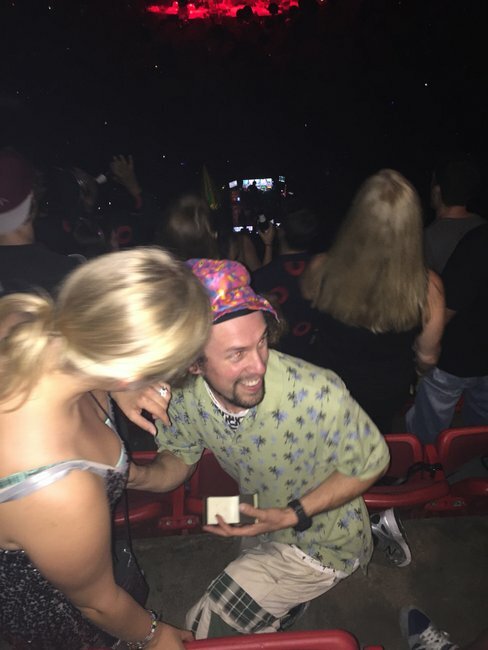 I’ll never forget the look in Rachel’s eyes when she realized I was pulling out a ring and getting down on one knee… dressed in my silly party hat… at a Phish show. 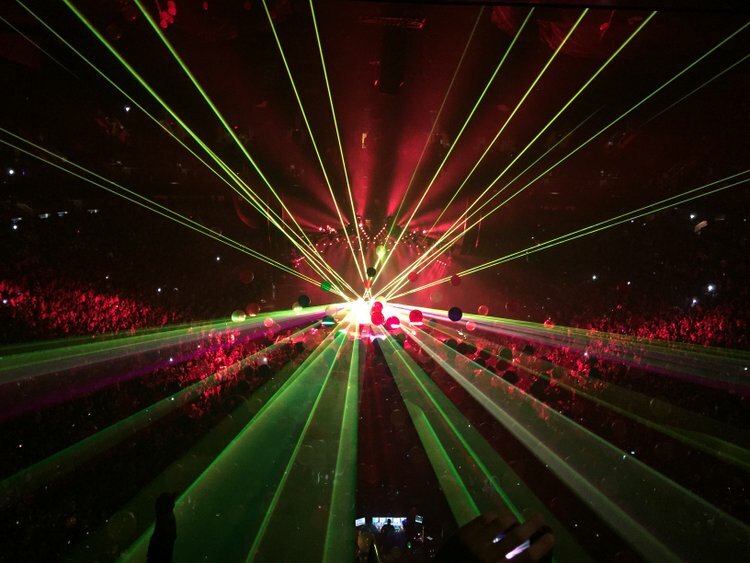 Her smile lit up the arena more than Kuroda’s lights ever could, and I saw tears of joy run down her cheek as our friends came to realize what was going on. Thankfully, a few of the more technologically savvy ones managed to snap some photos and video. Having seen over 50 Phish shows, I’ve grown accustomed to critiquing the setlists and paying close attention to the band’s playing. 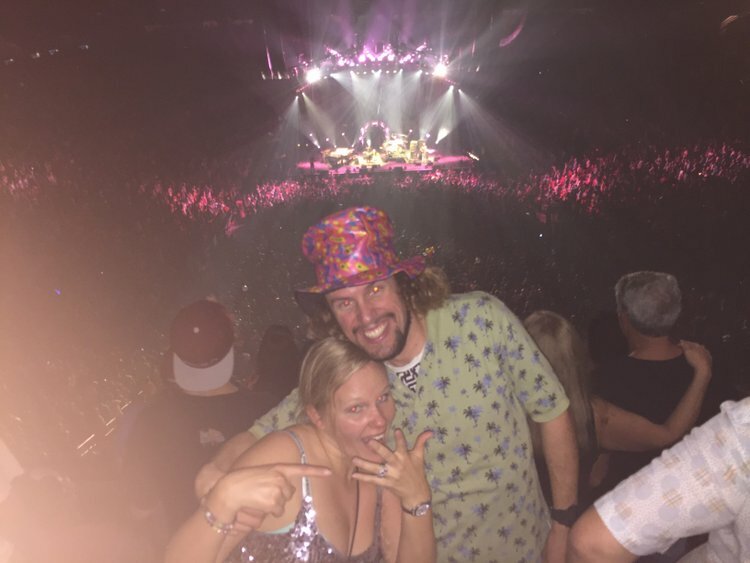 For that final set of the show, however, I couldn’t care less what was happening on stage – I just got engaged to my best friend, with some of my favorite people in the world around me, watching the best band in the world ring in a New Year. If there’s such thing as Cloud 9, I was definitely a few above it. 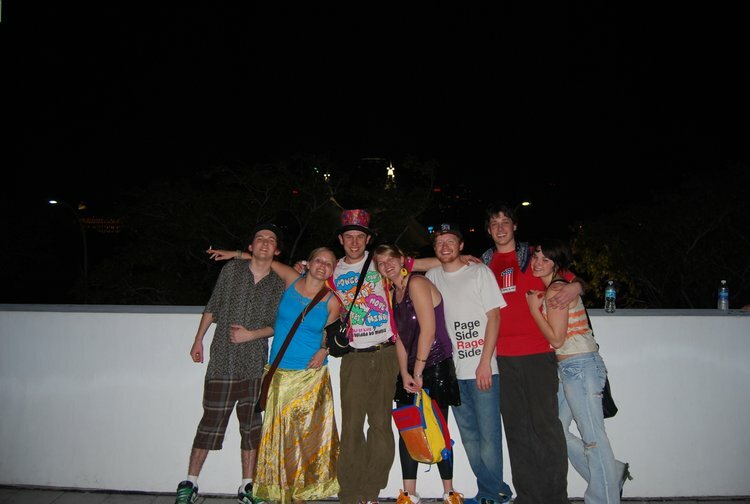 The first time Phish went to Miami for New Year’s was in 2003. At the time, I was a senior in high school and desperate to see my favorite band who at the time were just one year into their comeback. Somehow, I convinced my parents to buy me a flight down to south Florida as a Christmas present, and I used the little money I made from working in a pizza shop to throw down on a hotel room with strangers I met on the Internet and buy tickets. It was a life-changing experience to say the least, and that first Miami trip will stay with me forever. 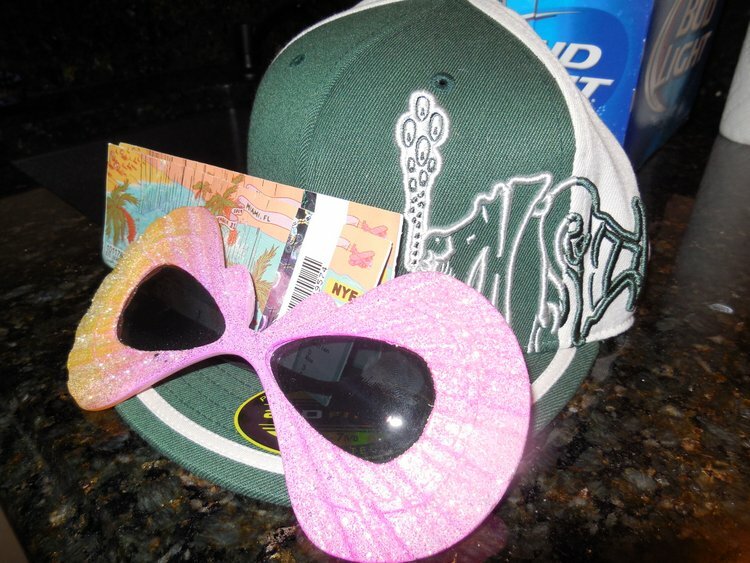 When Phish returned to the Sunshine State in 2009, I wasn’t going to miss out. The second time around was a bit different, though – I brought my girlfriend of six months and a whole gang of friends and family. Unlike a lot of sequels, this one lived up to the hype and then some. Little did we know, but things were going to change drastically for us in the months to come. Come March 2010, we were on a plane to Beijing to embark on a new life together. Fast forward to 2014, and Rachel and I were winding down a 14-month long backpacking trip around the US, China, and Southeast Asia. It was the culmination of many years busting our butts in Beijing, and we were living the dream as the Grateful Gypsies. 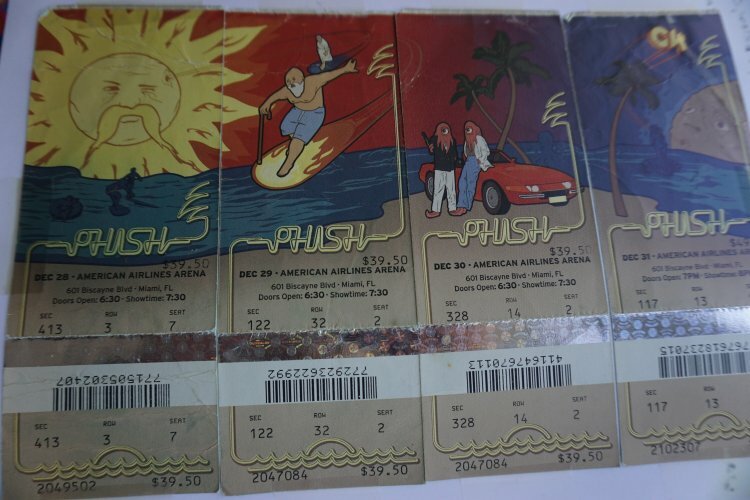 When Phish announced a NYE run in Miami to ring in 2015, I knew there was no way we could miss out. Beyond that, I felt that this was going to be a special opportunity to start a new chapter in our lives together. Rachel may not have known it at the time, but I had been scheming some kind of musical engagement for a while. 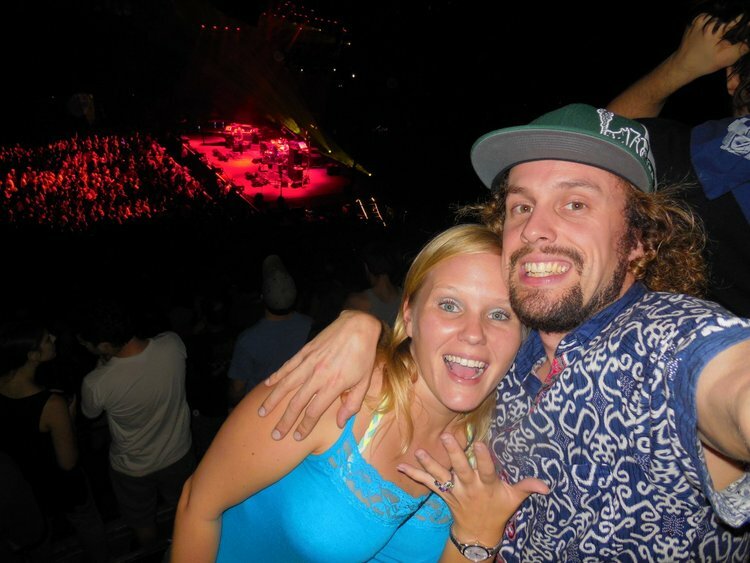 After all, we met at a music festival, started dating on Phish tour, and have met most of our closest friends through our love of live music. All signs pointed to Miami, and despite being a broke, jobless hippie living in a third tier Chinese city, I managed to pull it off. Third time’s the charm – Miami ’14. See ya’ll at the wedding!